Womens Enchanted Unicorn Dress Cosutme. 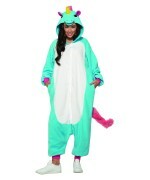 Includes velvet zipper front dress with tail and gold horn hood. Available in women sizes Extra Small, Small, Medium, Large, Extra large, and XXXL. Ready for a mystical night- Unicorns are known to be majestic creatures that only few have the luck to rest their eyes upon. This iridescent velvet dress features a zipper front with attached tail and hood with an attached golden horn. Sleeves have bright pink frails that add a little pizazz and magic to the look. 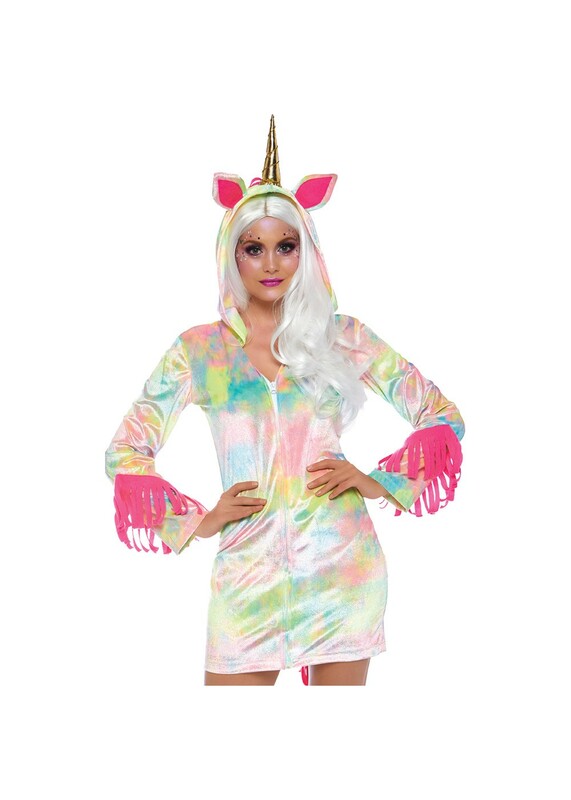 Put on some glittery makeup and white mystical wig and you will be serving looks at your next costume party! 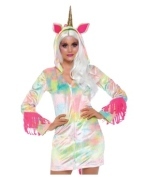 Review(s) for " Womens Enchanted Unicorn Dress Costume"